We have a network of approved consultants across the UK who can work with you to help develop effective management systems and ensure your organisation can meet the requirements of the ISO standards in a manner that doesn't add unnecessary extra work or overheads. Contact us for the details of your local ISO consultant or to have a chat about your requirements. Experienced Consultants - All our consultants have extensive experience of implementing ISO compliant management systems as well as broader business experience which they will use to try and help your organisation improve or adopt best practice. Quick fix & Ongoing Support - as well as helping with review and development of management systems we also provide ongoing support for companies who are not able to or do not wish allocate staff to developing or maintaining management systems and would prefer an external consultant to take the lead role and complete internal audits and other updates on a temporary or permanent basis. Good value - we try to make sure we provide good value and achieve as much as possible in each consultancy visit. Our consultancy service is based on a day / half-day rate and we only charge for work completed. We can provide a costed proposal detailing number of days consultancy / cost and activities / actions to be completed. The approach of our consultants follows the main philosophy of our business - Simple, Smart, Consultancy Services. Integrated & Streamlined - our consultants will help implement integrated management systems that are as simple as possible with no unnecessary complication. Enabling your independence - Our consultancy approach is to help our clients take control of their own management systems. To assist with this when we supply documents / files they will be in an editable office or equivalent format allowing you edit, amend and take full control. 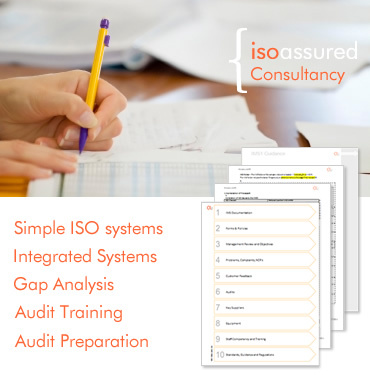 Avoid unnecessary complication - sometimes too much ISO consultancy can be dangerous as it can lead to development of overly complex systems which may end up serving the purpose of the ISO system itself rather than the business. At all times our consultants will strive to avoid creating unnecessary forms or procedures that lead to increased paperwork and provide little or no advantage to the company. Our consultancy service is backed up by our alpha-Z Documents package which can be used as a flexible framework for your management system. The alpha-Z documentation package is a simple yet comprehensive documentation package comprising forms, policies, registers, checklists and implementation guidance which our consultants can use to assist and support their consultancy. As well as onsite consultancy we also provide a remote consultancy service where we can provide remote assistance with preparing and writing any necessary procedures and the management system documentation required. Our remote consultancy package makes use of our alpha-Z documents package which includes various implementation checklists and guidance documents to enable the development of effective and ISO compliant management systems at much lower cost than a full consultancy package. We provide a simple and low cost transition package to update and transition your existing ISO documentation into a simpler format that also meets the requirements of the updated ISO 9001:2015 standard. Contact us for more details. Management Systems / Certification - The best approach? Not all companies need external help but there can be issues with trying to implement management systems by yourself just as there can be some issues with using a consultant. We have prepared the below potential pitfall planner based on our experience of some of the worst management systems we have seen over the years. Can we get ISO certified without any external help? Should we bring in a consultant? Can that company really get us ISO certified in 2 weeks without us having to do anything other than pay their bill? DIY Approach - This approach can be sensible for some companies and whether is it right for you will depend on who you have available to lead the ISO implementation process and how busy they are. There are several documentation packages that can be purchased to assist with this approach but some of them are very complicated and may actually make the implementation process take longer and ultimately lead to a management system that is bloated and unworkable. Fixed Fee - Guaranteed Certification in 14 days!! 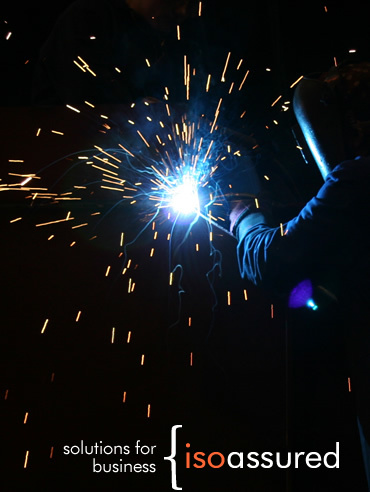 - This is where much of the pain & misery associated with ISO Certification is generated. Some of the fixed fee companies are expensive and often will provide very little service for the fee, typically giving the consultant a few hours to prepare and provide documentation using a Template based on the ISO standards. The management system provided and certified (usually by the same consultant) would be very unlikely to pass an audit by another certification company. Independent Consultant - There are some very good ISO consultants but there are also some terrible ones. The worst offenders tend to be the 'Jargon-Merchants' who try to make the entire ISO implementation process overly complicated and use the ISO standards to justify unnecessary and pointless activities. There are also 'UKAS Puritans' who will insist on only using UKAS accredited certification even when it isn't necessary and may actually place a burden on the company they are supposed to be helping. We are actively looking for consultants who share our vision and approach for assisting clients to implement beneficial and useful ISO compliant management systems. Contact us to find out more about becoming an isoassured approved consultant.